Throughout the automation lifecycle, iQ reduces your costs. First, project lead time is reduced due to the high level of integration and the iQ Works suite of engineering tools. iQ Works allows a system to be developed and commissioned faster thanks to powerful simulation tools and reduced programming. iQ Works supports all key iQ control types, whether it’s PLC, motion, or even HMI screen design. All Mitsubishi products are engineered to very high levels of reliability. However if maintenance is required, technicians’ productivity is improved in several ways. The open CC-Link network architecture and iQ Works allows a maintenance technician to troubleshoot an entire network of iQ controllers from one place. Line problems can be quickly located and addressed. If cabinets need to be opened, service personnel arrive prepared to take the correct steps immediately. iQ’s CPUs lead the industry in performance. 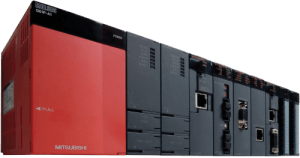 Combined with an advanced backplane architecture to optimize system communications, these provide faster ROI due to reduced cycle times and increased productivity. iQ’s PLC CPUs execute programs in microseconds while handling thousands of I/O. Advanced motion capabilities control dozens of axes simultaneously via the noise immune 50Mbit/s SSCNET/III network. In food and beverage applications, this eliminates mechanically based packaging systems. Machine design is simplified; lead times are shorter and job changes faster. Industries requiring automated assembly benefit from the iQ’s integration of a fully featured robotic controller. Combining process and discrete control on the same system also allows the iQ to handle a range of hybrid applications. Even complex systems such as transfer lines, requiring machining, motion and sequence control, can easily be handled in a single controller. iQ is compatible with a wide variety of networks for engineering complete plant systems. This includes the open CC-Link architecture, allowing a seamless flow of information throughout all levels of a plant, to enterprise IT systems and beyond. iQ also takes full advantage of CC-Link IE, the world’s first gigabit Ethernet open automation network. No longer does your network limit the productivity of your enterprise as information becomes freely available to those who need it. A final key point is the iQ’s scalability. While capable of automating whole lines, it is equally at home running single machines. Configure the platform as a PLC or motion controller alone when high performance on small scale systems is critical. Whatever your needs, there is an iQ solution that meets them precisely. iQ is the world’s first automation platform combining all key automation types on one controller. Avoid wasting valuable engineering resources trying to make different vendors’ systems work together. With iQ, Mitsubishi takes care of system integration. iQ offers an extensive array of controller types that seamlessly operate together on the same back-plane. Now your engineering staff concentrate on the demands of the application itself right from the beginning.